Back a couple of weeks ago, I tagged along with my daughter Amber to bring her to Hour of Code. The class that she chose was being taught through Khan Academy, and as a person there, I figured I’d tag along and see what she was doing. In the process I set up an account, and then I forgot about it for a couple of weeks. 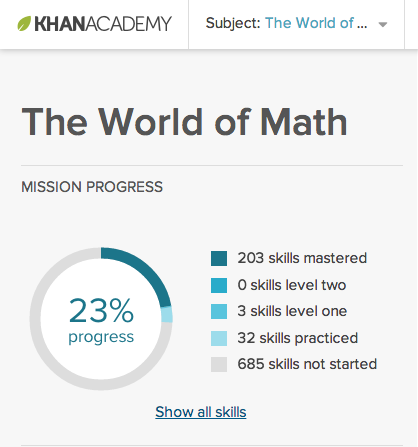 During my holiday break, I was reading some posts about mathematics education, or in some cases lack thereof, and a friend of mine, who is a long tenured engineer, told me that he had gone back through Khan Academy and walked the Mathematics section, solely for the purpose of seeing how much he had forgotten over the years. His final analysis. It turns out he’d forgotten a lot of things, but more to the point, he mentioned that he came in contact with concepts that he had never studied, and how fun he found it to go through and check those areas out. I must confess, it takes a special kind of masochist to go and do math “for the fun of it”, or should I say, that was my initial reaction. Still, I found myself with several days off last week, and will have several more this week, so I made a personal challenge for myself to take on the same challenge. There is a track called “The World of Math“, and it covers everything from the basics of Kindergarten level arithmetic all the way through to Linear Algebra. For the record, I managed to make my way through in my twenties to completing mathematics courses up to and including Differential Calculus, and then I hit a wall. I fancied that, maybe, I could give my old rusty neurons a workout and see if I could push through it all and get to those areas I never learned. To add to that, I have pulled in several other topics that just tickled my fancy, and I’ve been having a lot of fun walking through and checking them out (as of last Tuesday, I’ve gotten through entire lecture blocks on World History, Biology, Music Appreciation and Greco-Roman art). The materials range from really well produced to someone’s screencast on a topic that interests them. All of them are proving to be a fun way to spend time and learn. Because much of the material is bite sized, i.e. can be viewed in anywhere from five to ten minutes, you get the feeling that you are getting a broader appreciation for these subjects, and doing so a little bit at a time (and quite often, you find yourself realizing that you are spending a lot of time, but you don’t mind it one bit! ).